The Copper Cool Hybrid Firm Cal King Firm Hybrid Mattress and 5" Geneva Black Low Profile Foundation by Sleep Shop Mattress at Del Sol Furniture in the Phoenix, Glendale, Tempe, Scottsdale, Avondale, Peoria, Goodyear, Litchfield, Arizona area. Product availability may vary. Contact us for the most current availability on this product. 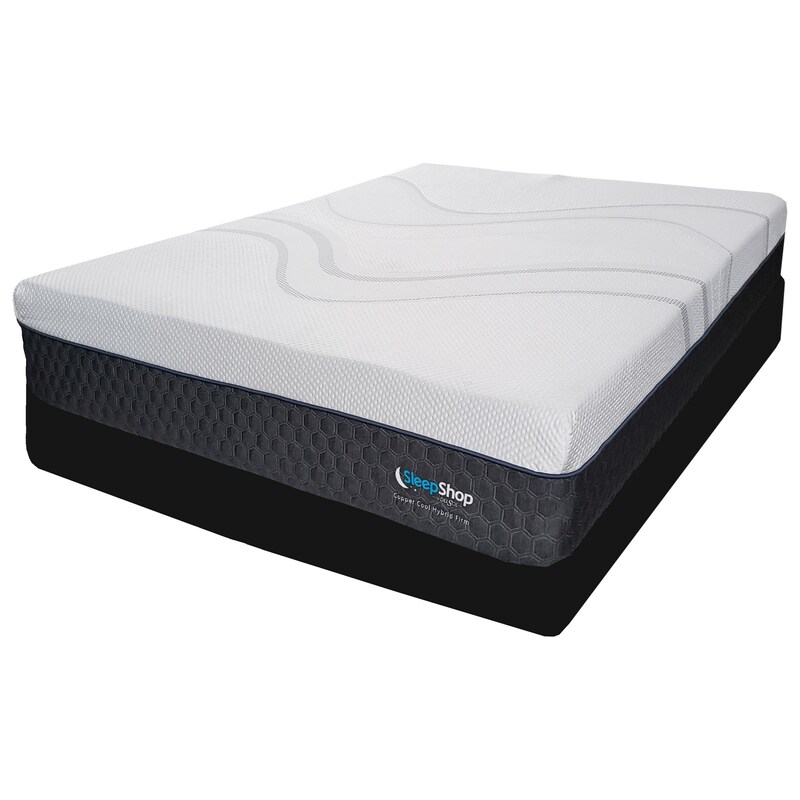 Sleep cooler with the Copper Cool Hybrid Collection of mattresses, with a special cooling fabric and Cool-Bounce Copper Gel Memory Foam which actively moves heat away from you. You'll feel the support of the individually wrapped coils as they adjust to your individual shape. A foam encasement provides a firm edge for full surface use. Comfort layers include responsive Gel Memory Foam which conforms to your body for customized support with out the sunk in feeling. All this, plus made in the USA and a 10 year warranty, what a value! The Copper Cool Hybrid Firm collection is a great option if you are looking for Mattresses in the Phoenix, Glendale, Tempe, Scottsdale, Avondale, Peoria, Goodyear, Litchfield, Arizona area. Browse other items in the Copper Cool Hybrid Firm collection from Del Sol Furniture in the Phoenix, Glendale, Tempe, Scottsdale, Avondale, Peoria, Goodyear, Litchfield, Arizona area.